Mystery, romance, dancing. 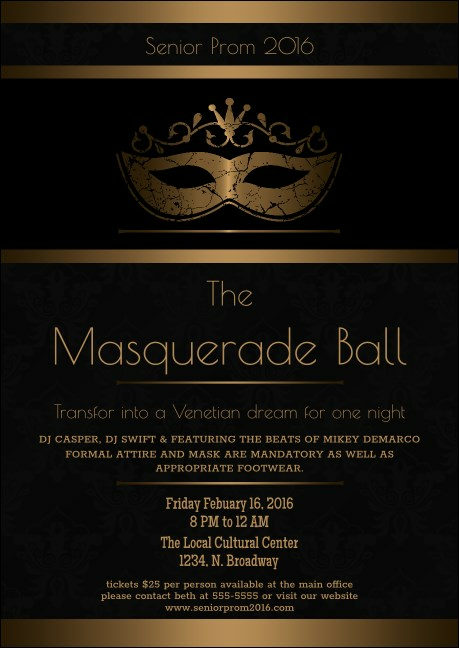 Spread the word about your bal masqué by ordering customized, printed Masquerade Ball 3 Postcards and sending them out well in advance! Laid out in black and gold, this postcard template’s understated, Art Deco-inspired design spells out your event’s details through fourteen available text lines. Tailor to your fete via the simple form below and we’ll print in color and ship! Capture the essence of your celebration with customizable postcards from TicketPrinting.com.